Driver Jeff Gordon and Hendrick Motorsports owner Rick Hendrick met with the media Friday at Indianapolis Motor Speedway to talk about the four-time Sprint Cup champion’s return to the cockpit. Gordon, who retired from driving duties following the 2015 season, will fill in for HMS’s Dale Earnhardt Jr. who is recovering from “concussion-like symptons”. Hendrick announced this week that Gordon will drive the 88 Chevrolet in this weekend’s Brickyard 400 and next week’s race at Pocono Raceway. WHAT ARE YOUR THOUGHTS OF GETTING BACK IN THE CAR? WHAT ABOUT THE CONDITIONING NEEDED TO BE IN THE CAR JEFF? IF YOU COULD TALK ABOUT HOW DALE IS DOING? WERE YOU ON VACATION WHEN A LOT OF THIS WAS GOING ON? WHAT WAS INGRID’S RESPONSE WHEN YOU SAID YOU WERE GOING TO GET BACK INTO THE CAR? WHAT WAS MR. H APPROACH TO THIS? WHAT GOOD DOES THIS DO FOR YOU THAT YOU ENDED YOUR CAREER IN SUCH INCREDIBLE FASHION AT HOMESTEAD – WHAT IS IN IT FOR YOU? CAN YOU DETAIL OUT WHAT YOU WEEK HAS BEEN LIKE? HOW MUCH HOMEWORK GOES INTO THIS? HOW LONG ARE YOU PREPARED TO DO THIS? 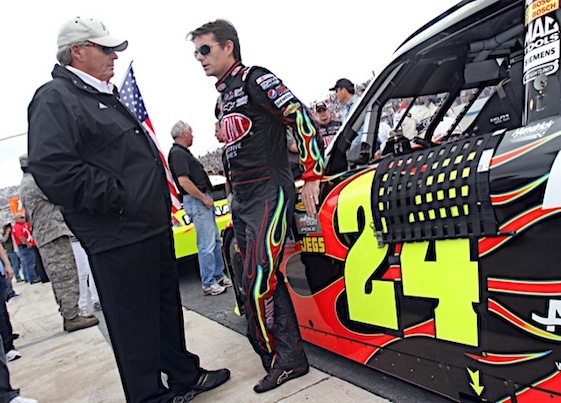 JEFF GORDON: “First off I will just walk you through a little bit. I got back from France on Tuesday. I landed in New York; Mr. Hendrick was kind enough to have a plane there waiting for me to bring me to Charlotte. I landed in Charlotte, drove straight to the shop and spent the evening with the team. They had already put the seat in and the steering wheel and had been working with the No. 24 team that had access to everything the seat and the liner. Luckily, we have archived and kept a lot of these things. Really, this is basically my seat from Homestead, probably my steering wheel as well. So, I spent the evening and it was really close, there were just a couple of little minor tweaks. I came back the next morning to the shop and started that process. I had to get a physical. I had to do all the NASCAR requirements. I have an owner credential I don’t have a driver credential, so had to go through that process and spent the whole day there with (crew chief) Greg Ives. The cool thing about Greg Ives is he reminded me that he worked for Robbie Loomis when Robbie was my crew chief and he was telling some great stories about working with Robbie. I’ve known Greg for a long time and always been impressed with him. But, I have never had the opportunity to work with him. I’m looking forward to working with him. I think he’s a great crew chief and they have a great race team. I spent a lot of time with him and his team and the engineers going over data from the test that were here. We have video, we have like Go-Pro video from inside the cars that I can watch Jimmie Johnson, Chase Elliott, they both tested here and all their data. HOW LONG ARE YOU PREPARED TO DO THIS? HAD YOU AND MR. HENDRICK DISCUSSED THIS POSSIBILITY AT ALL LAST SEASON? OR WHEN THE REQUEST WAS MADE WAS IT A COMPLETE SURPRISE? HAD THIS OF BEEN PART OF THE FOX PORTION OF THE SEASON WOULD YOU HAVE BEEN AVAILABLE TO DRIVE? IS THERE ANY OPPORTUNITY DURING PRACTICE FOR YOU TO PRACTICE PIT IN AND OUT, AS WELL AS, STARTS AND RESTARTS? JEFF GORDON: “Well the crazy thing about all this I was asked to drive Tony Stewart’s car in Daytona to start the season out with his injuries and the incident that happened there. No, I wasn’t able to do it because of my commitments to FOX. Now, Rick has some amazing ways to convince people into things that the average person might not be able to. So, I don’t know maybe he could have called Eric Shanks (President, COO and Executive Producer of FOX Sports) or something, but no I don’t think so. That is what to me when I think about this whole scenario… I mean I’m driving in the track last night just going ‘wow’. The last seven days have just been a whirlwind. And the fact that it’s Indianapolis, I don’t know it’s kind of hard for me to really wrap my brain around it right now. ANY CHANCE DURING PRACTICE TO PRACTICE PIT IN AND OUT? IS IT GOING TO BE A LITTLE WEIRD CLIMBING INTO A CAR WITHOUT THE NO. 24? AFTER YOU READILY AGREED TO FILL-IN WAS THERE A LITTLE BIT OF HESITATION AFTERWARDS? YOU SPENT THE FIRST HALF OF THE YEAR IN THE MEDIA. DOES THAT GIVE YOU A GREATER APPRECIATION FOR HOW IMPORTANT SPECIAL STORIES LIKE THIS ARE? NOT JUST FOR THE MEDIA, BUT FOR TRACKS LIKE INDIANAPOLIS AND POCONO AND THE FANS IN NASCAR? GIVEN EVERYTHING THAT YOU’VE BEEN THROUGH IN RACING AND PERSONALLY, HAVE YOU BEEN ABLE TO OFFER ANY PERSPECTIVE TO JUNIOR AS FAR AS A ‘ONE DAY AT A TIME PHILOSOPHY’ MOVING FORWARD? “Dale and I talked earlier about multiple years beyond next year and I was involved when he went to the doctor. And then the doctors really rook over and then we text back and forth. And then I got to see him face-to-face. But, I care about him as a friend and someone that means a lot to me and I want him to be healthy and right when he gets in the car and the doctors are going to dictate that. WHAT ARE YOUR IMPRESSIONS OF THE EVOLUTION OF DRIVER AWARENESS OF THEIR PERSONAL HEALTH? THERE’S THE GREAT STORIES LIKE WHEN RICKY RUDD TAPED HIS EYEBALLS OPEN. THAT’S GONE. THAT’S EXTINCT. HOW HAS THAT EVOLVED DURING YOUR CAREER, JEFF? YOU HAD BACK ISSUES BUT YOU WOULDN’T GET OUT OF THE SEAT. HOW HARD IS IT FOR A DRIVER TO MAKE THAT DECISION? WHAT DOES IS SAY ABOUT DALE THAT HE MADE THIS DECISION HIMSELF TO SEEK OUT THE DOCTORS AND BE PROACTIVE? “That’s one of the things that immediately stood out to me was how proud I was of Dale to seek out those doctors and to recognize…. And he’s somewhat been through something similar to this in the past. And he set a great example then and I think he’s setting a great example now because if he didn’t seek out those doctors, then I don’t know if he would have known exactly what was going on. And now he’s much clearer on that and I think it’s going to benefit him long-term, not just as a person, but as a race car driver, as well. So, I’m very proud of him for doing that and it sets an amazing example to others. DO YOU THINK THEY WILL BECAUSE HE DID IT? YOU MENTIONED THE MORALE BOOST ABOUT HAVING DALE IN THE SHOP THIS WEEK. IT’S BEEN A ROUGH STRETCH FOR YOUR TEAM AND IT SEEMS LIKE THEY ARE IN A BIT OF A SLUMP. HOW DIFFICULT IS IT TO HAVE ALL THIS GOING ON WHILE YOU’RE TRYING TO CATCH THE COMPETITION ON THE TRACK? DO YOU KNOW WHERE YOU ARE BEHIND? CAN MAYBE JEFF HELP EVALUATE WHERE YOU’RE TEAM CAN IMPROVE? THE FOLKS AT INDIANAPOLIS MOTOR SPEEDWAY STARTED TALKING IN FEBRUARY ABOUT JEFF GORDON DRIVING THE PACE CAR AND BE THE FIRST CELEBRITY DRIVER TO DRIVE BOTH THE INDY 500 AND THE BRICKYARD 400; AND WERE ON THE VERGE OF ANNOUNCING IT BEFORE HE CALLED. CAN WE GET A RAIN CHECK ON THAT?